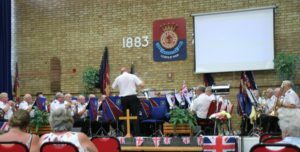 Band members gathered for a time of fellowship over tea (always something to be looked forward to at Gravesend) before providing a programme of music on one of the hottest days of the year. As well as some exciting tennis going on at Wimbledon, the England football team had boosted everyone’s morale by qualifying for the semi-final of the World Cup. How better to end the day than by enjoying a programme of exciting and God glorifying music. 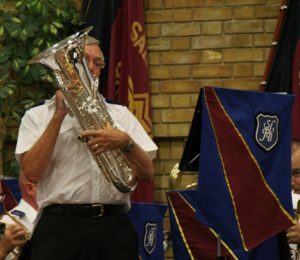 The Salvation Army ‘Founder’s song’, ‘O Boundless Salvation’, along with ‘Send the fire’ formed the theme of the opening march ‘Light-bringer’ by Martin Cordner. This bright and scintillating music was followed by Leonard Ballantine’s arrangement of ‘Mid all the traffic’ which brought listeners to that quiet place within ourselves where we invited God to come and dwell. 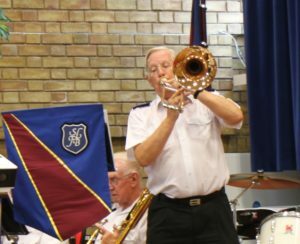 Corps Sergeant Major Richard Arnold piloted part of the programme and introduced the song for the congregation to sing – a recent arrangement by Norman Bearcroft of ‘I’ll stand for Christ’. Given the National football team’s win earlier in the day, it was appropriate that the plans for the evening included a patriotic element and the programme continued with the march ‘Britannia’ by Kenneth Smith. This exciting music couples the nationalistic ‘Rule Britannia’ with the religious ‘Stand up for Jesus’ reflecting the nature of the evening. Musical contrast came next from the ‘classical’ repertoire, in the form of an extract from Schubert’s Fifth Symphony arranged for brass band by Brian Bowen. Very much ‘light classical’ music, it has some delicate touches which came across in the playing. A solo came next with the stylish presentation of ‘Blessed Assurance’ – a trombone solo in salsa style written by William Himes and presented by Maurice Horwood, which was well received. The song ‘Take my life and let it be consecrated, Lord to thee’ followed in an arrangement by Kenneth Downie and titled ‘All for thee’ after which the congregation were reminded of the words ‘He who would valiant be’ in the Variations on that theme by Thomas Rive called ‘A pilgrim song’. After an interval to try to cool down on this hot evening, the second half commenced with another exciting Martin Cordner arrangement ‘Call of the Gospel’ expressing the truth that ‘We have a gospel that matches the hour, we have discovered the true source of power…. Man has no meaning, no purpose, no soul, ‘til he discovers that God is his goal’. This was followed by the male voices singing Norman Bearcroft’ arrangement of ‘Simply trusting’ and the band playing Paul Sharman’s arrangement of ‘All the world is waiting’ before a bible presentation by the Band’s Chaplain, Roger Gadsden, linking the band’s item ‘A pilgrim song’ to John Bunyan’s pilgrim in his book ‘Pilgrim’s progress’. 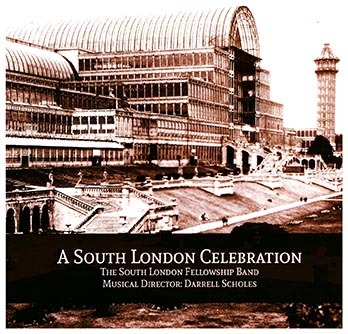 The final section of the programme returned to the patriotic theme with a ‘last night of the proms’ type section. This included some of the favourites with which people could join in and sing; Jerusalem, I vow to thee my country, and Land of hope and glory but also included the virtuoso Euphonium solo ‘Brillante’ written by Peter Graham. This fast-moving, exciting piece, which includes an extended Cadenza, took the breath away, not least for the soloist Adrian Horwood who showed his skill in dealing with the extensive range and volume of notes in this difficult solo. So ended an evening of patriotic and Christian music – entertaining and challenging to all who attended.